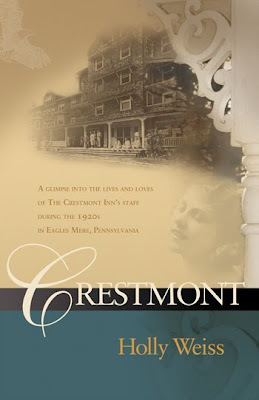 Crestmont is novel about a young woman named Graicie in 1920’s Pennsylvania who has fallen for her sister’s husband. To prevent things from escalating, she leaves her home and family to pursue a career as an opera singer. She finds work as part of the cleaning staff at an enchanting lakeside inn named Crestmont. The inexperienced Gracie soon finds herself amongst patrons and a colorful cast of fellow employees, including Bessie who proves to be a most difficult colleague. She is befriended by the inn’s owners and their two daughters. Gracie is dependable and a hard worker, and soon she is given better tasks, one of which is to care for an older woman named Mis Cunningham one day a week, which brings down a realm of new problems for Gracie. Crestmont is very much a character driven novel about how a group of people, thrown together in the confines of a mountain resort, learn to live and interact with each other, each growing and developing along the way. Author Holly Weiss developed the novel after she visited the hotel. From there, after a bit of research, she developed the characters and story incorporating the inn’s history, architecture and furnishings, and its beautiful surroundings. Although the heroine tends to be a little weak and the plot is more gentle and flowing than riveting, what I enjoyed most about this novel was being swept away, as if I were on vacation, to the quaint inn. The author did a great job of describing historical details. The prose was pleasant and flowing and allowed one to fall into the story easily. All in all, a delightful, tender summer read.